When did you start practicing and what brought you onto your mat? N: I started right after moving to New Orleans. It had been my “to do list” while I was living in Ireland beforehand but [yoga] wasn’t really anywhere, and so when I moved here it was like, ‘ok cool it’s accessible’! 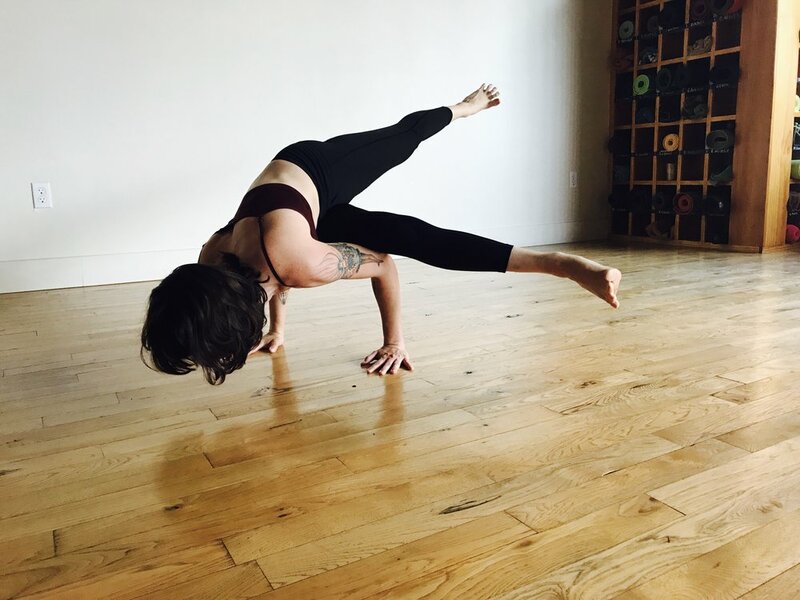 I’ve been here for seven years [and practicing] for six and a half years… I always want to dance and move and be weird- so I knew that [yoga] would feel great! The focus yoga places on balancing out your body, getting to know your body, and creating some sort of physical intelligence [while] being this very expressive and delicious thing is really attractive to me. And… I was just ready to start taking care of my body. What about this practice keeps you so loyal and dedicated to showing up everyday?! N: Well I do appreciate the psychological and philosophical aspects of yoga, but honestly it’s the physical aspect that attracts me the most. And then aside from being curious about the physical language of sensation, I notice that if I skip yoga for ‘x’ amount of time I really notice a difference. But if I’m practicing regularly, I feel balanced, I feel good, and I’m able to be a better person in the world. It’s my hashtag self care. It’s my sanctuary! So I make sure to try and prioritize this and come everyday. What are some of the more challenges aspects of this practice for you? N: Trying not to let my ego get in the way! You know, if you really want get your toe to your head or reach any kind ‘outcome’... just trying to [remember] that it’s not about that, it’s about the journey. And the practice is this kind of tangible reminder that this is a lifelong process, and it’s not just about obtaining a physical shape. Has your intention behind practicing yoga evolved since you began years ago? N: Yes, I think that in the beginning I was just proving to myself that I could [even] do it! And now my intention is to carry out my [broader] intention of taking care of myself. And then when I get here, I get to sink into being present and begin the practice of observing myself. How has yoga impacted your life outside of the studio? N: After practice, I always feel more equanimus and compassionate towards others. I think that I used to be more quick to react and lose my temper in stressful situations, but over the years I have been able to become a little more peaceful and empathetic. I also just feel like my daily yoga practice highly informs and supports the work that I do for my job as a massage therapist! Have you found this practice to be healing for you in any way? N: Totally. Since I’ve been coming to this space for five years… I’ve been through so much in life. And I have had so many moments of letting things go here and crying in savasana… Or when I had been crying all day- I got to come here and feel empowered. I have had a lot of emotional healing here, because it’s my place to touch base with myself. And whether I like it or not- when I’m [on my mat] I get to face myself and go from there. Do you have any advice for anybody who is nervous or anxious to start yoga? N: Just try it and know that… if you want to feel good… do it! And it’s never too late to start. The time for yoga is now!